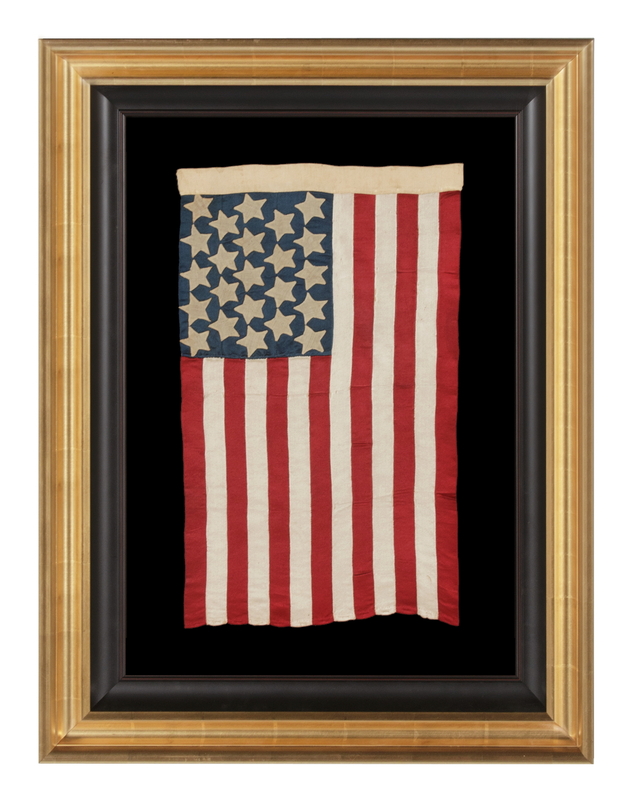 Frame Size (H x L): 30.75" x 23.25"
Flag Size (H x L): 20" x 12"
Maine joined the Union as the 23rd state on March 15th, 1820. 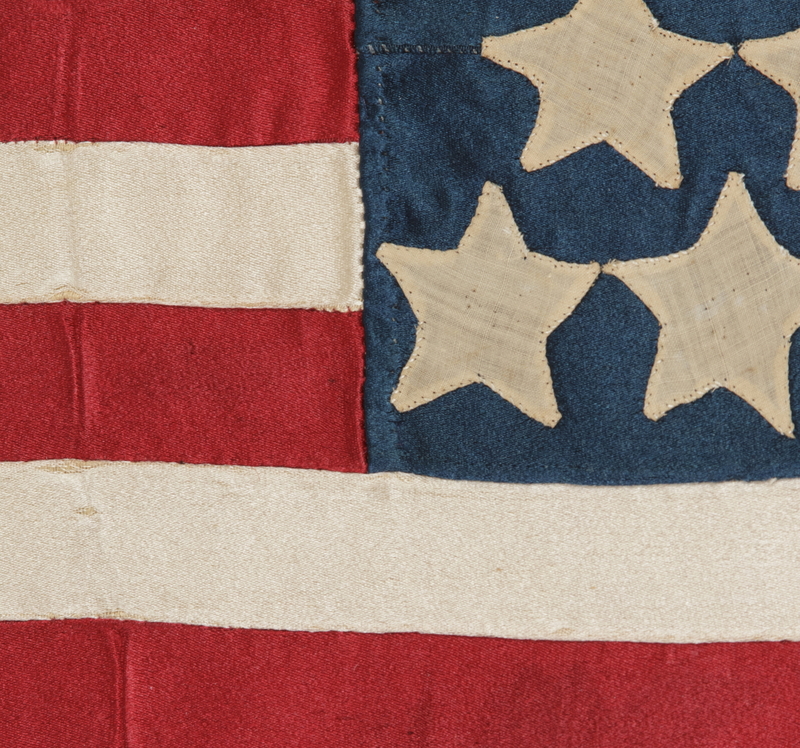 Because it was followed by Missouri, on August 10th, 1821, the 23 star flag was accurate for less than a year-and-a-half. Because new star counts became official on the 4th of July following a state's addition, the 23 star count was official for just two years (1820-1822). It was for these reasons that the lifespan of 23 star flags encompassed a very narrow window. Flag production was very low at this point in American history to begin with. 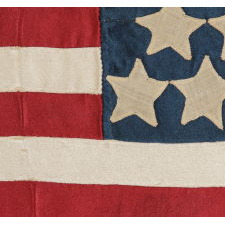 At this time, use of the Stars & Stripes was primarily limited to ships, government and military landmarks. No surviving 23 star flag that actually dates to the 1820-21 period is documented in any text on flag history or flag collecting, and I am likewise unaware of any that are extant but unpublished. While period examples of American national flags with 23 stars do not appear to exist, all early star counts were reproduced at later dates for a myriad of reasons. 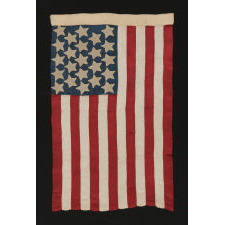 During the Civil War, for example, some flag-makers produced copies of the Stars & Stripes with counts between roughly 18 and the low 20's, to represent the number of states that he/she felt were loyal to the Union, thus excluding the Southern States from the total. The same was true in the South, where sympathizers of the Southern cause made versions of the national flag that removed both stars and stripes representing Union states. Sometimes the makers of flags simply ignored the official or otherwise accurate star count, in lieu of practical considerations. The U.S. Navy flew 13 star flags on small boats until 1916, because it was easier to discern fewer stars at a distance on a small flag. Commercial ships sometimes mirrored this practice, reverting to our flag's original number of stars. 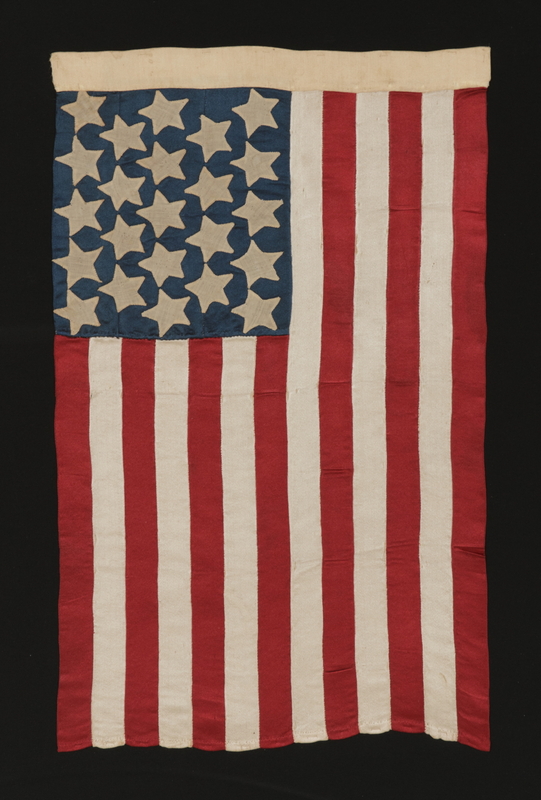 Beginning around 1890, many commercial flag-makers chose the 13 star count for smaller-scale flags especially. 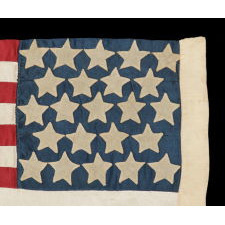 Other low counts can be encountered on smaller scale U.S. Navy flags as well, especially in the mid-19th century, when examples could be encountered with 16 and 20 stars. 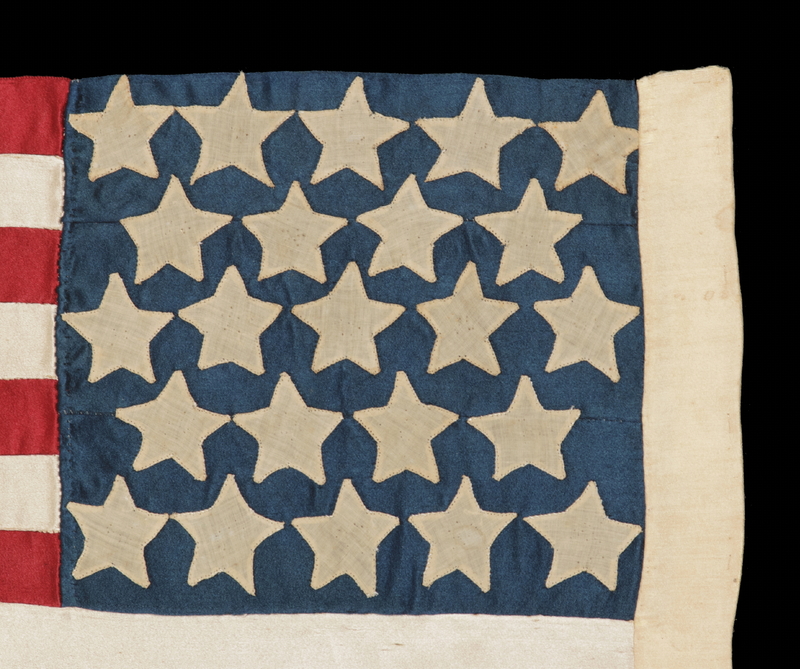 During the same period, some 12, 15, and 24 star flags are also suspected to have been fabricated for U.S. Navy purpose. The Navy seems to have preferred various low counts, where the number could be laid out easily in staggered rows or, more often, a neatly justified rectangle. Another place where one may also expect to have found flags with lower-than-actual star counts was at World's Fair events, where historical displays objectified state-associated patriotism and told the story of the growth of America. Historical flags might also appear at localized celebrations, held to commemorate anniversaries of statehood or national patriotic events. The 23 star flag that is the subject of this narrative was probably produced for one of these purposes. Made of satin silk and entirely hand-sewn, it was constructed sometime in the post-Civil War era of the 19th century, most likely between the 1870's and the 1890's. Homemade and one-sided, there are several possibilities behind its manufacture. Maine celebrated 50 years of statehood in 1870, followed by its 75th anniversary in 1895. It's unclear just how extensive local celebrations were in either of those two years, but in 1920 the Maine Centennial Exposition was held in Portland to commemorate the 100-year mark. Festivities included a parade in which there was a float featuring Lady Columbia, where she could "seen placing the star of Maine on the flag among the stars of her older sisters." [Rogers, William Chapman, "One hundredth anniversary of Maine's entrance into the union: official program of state celebration, Portland, June 26th to July 5th 1920" (1920).] Although this particular flag pre-dates 1920, this is exactly the sort of function in which a flag of this nature could have appeared in 1870 or 1895. Another likelihood of origin would be State of Maine displays at World's Fairs. During the period in which this flag was made, there were a number of such events, two of which were massive in scale. In 1876, our nation's first successful World's Fair took place in the City of Philadelphia. Held over a 6-month period, to celebrate 100 years of American independence, more than 200 buildings were erected in Fairmount Park to accommodate exhibitions. Maine had an exhibit in what was called the "Main Building," which offered 20.2 acres of space on the bottom floor and 1.45 acres on the top. With its open, cathedraled expanses, the Main Building yielded many ideal places for the display of flags, both above the exhibits themselves on staffs, along the perimeter walls, balconies, and high in the rafters. In 1893, the World's Columbian Exposition took place in Chicago. Even larger than the Philadelphia Expo, the premise of the Chicago World's Fair was the 400th anniversary of the 1892 landing of Christopher Columbus. A dedication occurred in October of that year, but the opening was delayed until 1893 due to the extensive demands of its construction. The exposition covered more than 600 acres and featured just under 200 new buildings, the centerpiece of which was a huge, manmade lake that was included to represent Columbus's crossing of the Atlantic. 46 nations participated and more than 27 million people attended. The scale and grandeur of the World Columbia Expo far exceeded the other world's fairs and became a icon of the emerging notion of American exceptionalism. Some states, including Maine, had independent structures. The stars of this particular example are made of cotton and are appliquéd with an uncommonly large number of fine stitches. These are arranged in staggered rows of 5-4-5-4-5. The stripes are actually constructed of satin ribbon, which negated the need for flat fell seams. 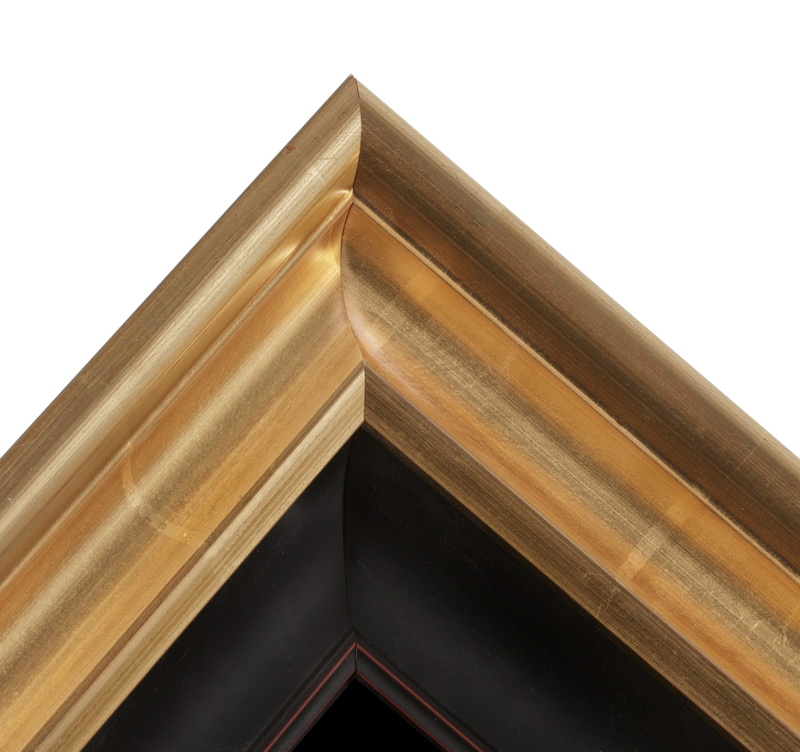 The canton is comprised of three lateral lengths of wider ribbon. All were joined to one-another in a similar level of stitchery to that present in the application of the stars. There is a ribbed, peau-de-soie silk binding along the hoist, in the form of an open sleeve. At just 12 x 20 inches, the size of the flag is tiny among its counterparts. 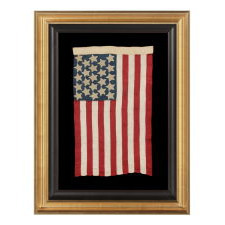 Because very little exists in the way of pieced-and-sewn American flags of this scale, and because the size makes it so easy to display, this adds a significant level of desirability across most of the collector community. While the exact origin of the flag is not known, 23 star flags are extremely rare in any period. I would estimate the number of presently identified examples, none of which were made at the time when we had 23 states, to fall between 5 and 10. For these reasons it would be a welcome addition to almost any collection. 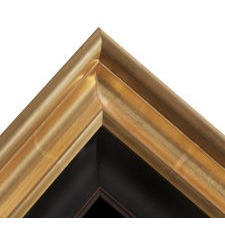 The mount was placed in a gilded French molding with an early American profile, to which a dark brown molding, nearly black, with reddish undertones and highlights, was added as a liner. The background is 100% cotton twill, black in color. Spacers keep the textile away from the glazing, which is U.V. protective glass. Feel free to contact us for more details. Condition: The condition is exceptional, with but extremely minor staining. The Maine House from the Chicago fair survives today in the town of Portland Spring (ME). According to the Portland Spring Preservation Society, " The State of Maine appropriated money to construct the building and the design of Charles Sumner Frost, originally of Lewiston, was chosen. The building was to be made of Maine materials in order to exhibit the quality of the state’s resources as well as the quality of its craftsmanship. The first floor exterior of the octagonal building was made of Maine granite from Norridgewock, Freeport, Biddeford, Hallowell, Vinelhaven, Addison, Red Beach and elsewhere in the state while the roof was 40 tons of Maine black slate from the Monson Slate Company of Monson. The wood that made up the interior and exterior came from Maine forests and crafted by Maine crafters while the fine carved oak fireplace mantel was crafted by Morse and Company of Bangor. The original door and window screens were manufactured by the Portland Screen Company and E.T. Burrowes Company of Portland and the plush portieres were supplied by the Sanford Manufacturing Company of Sanford. [Following the fair,] the Ricker Family bought the building for $30,000. Arrangements were made for the dismantling of the building and shipping by freight train back to Maine. It was to take 16 freight cars." Subsequent events where Maine participated through the early 20th century included the 1901 Pan-American Expo in Buffalo, the 1904 St. Louis Expo in Missouri, the 1905 Lewis & Clark Expo in Portland Oregon, the 1909 Hudson-Fulton Expo in New York, the 1915 San Francisco Expo in California, and the 1926 Sesquicentennial Expo (our nation's 150th anniversary) in Philadelphia.